(i) The High Voltage laboratory at Cardiff has three separate shielded test areas for AC, DC and Impulse testing. It has a pollution test chamber (IEC60507) and a tracking and errosion test facility (IEC 60587). 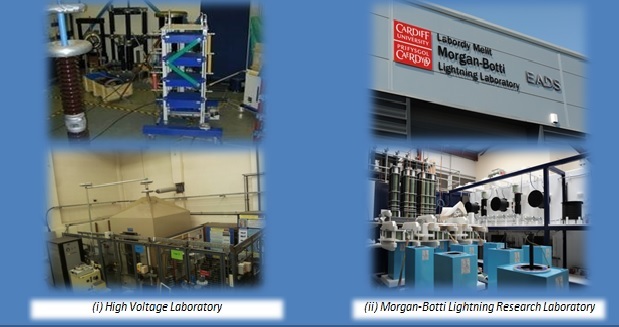 (ii) The Morgan-Botti Lightning Laboratory at Cardiff is a newly established facility funded jointly by the Welsh Government and EADS. The Lightning Laboratory is capable of generating controlled lightning up to 200,000 Amps. Research at the Lightning Laboratory is focused on understanding of lightning effects on materials, reducing the environmental impact of air travel, as well as making it safer and more efficient. Good vehicle access to both laboratories (Central and South Cardiff), Cardiff airport 12miles, Cardiff Central train station, 0.5mile.